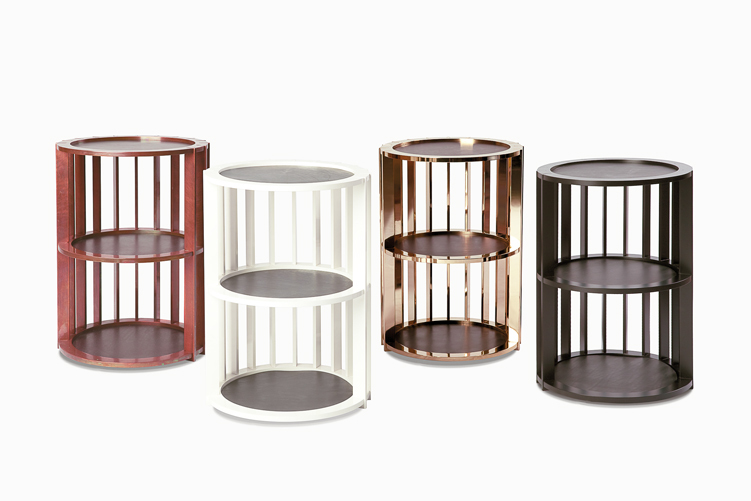 Bedside or side table in varied metal and powder coated metal finishes with bridle leather tops. The Rib side table was developed to fit in a room which I was asked to design for a longstanding Client. The room was to be a private study for a lady with a hint of Hollywood; it also had to function as a bedroom for her son when he was home from college. All of the pieces in the room were bespoke bar the desk chair and armchair. The room was quite narrow so the table had to fit in a very tight space between the bed/sofa and the door. I felt that the table should be round that that is no sharp corners and as the theme of the room was mostly black I wanted to propose that the table would be in brass to add a splash of glamour, the size was dictated by the space so had to be less than 380mm dia. First attempts at sketch ideas were very airport bin like so I wanted to make the table less solid but still hide messy switches on the wall. As it was so small I also wanted to add shelves, after a lot of thought and a few more sketches I had the bones (or at least the ribs) of an idea. After a basic CAD drawing I was unsure of the proportions of the metal ribs and how they fit into the shelf tiers, so unusually for me I made a foam board model to explore the sizes and how the ribs would fit together, I was also just beginning to work with a 3D visualizer so experimented with this. Time running short (though I have a very patient Client) I then had the technical drawings drawn up by a freelancer to take to the metalworkers. From the beginning I had wanted to develop the table as a product and not just a one off. 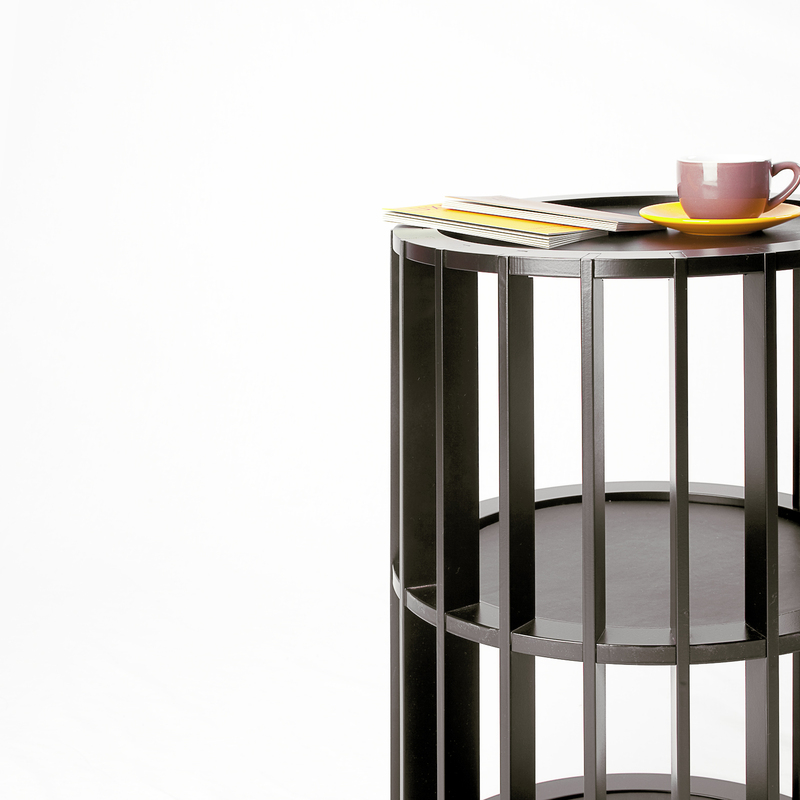 The first table was made by a small London metal workshop. Because of the weight, we made the table in aluminium and we decided to finish in a hand applied bronze. I have specified saddle leather quite a lot, which is common in furniture in Italy but seems difficult therefore very expensive in the UK, however I managed to find a good source for the round leather pads. 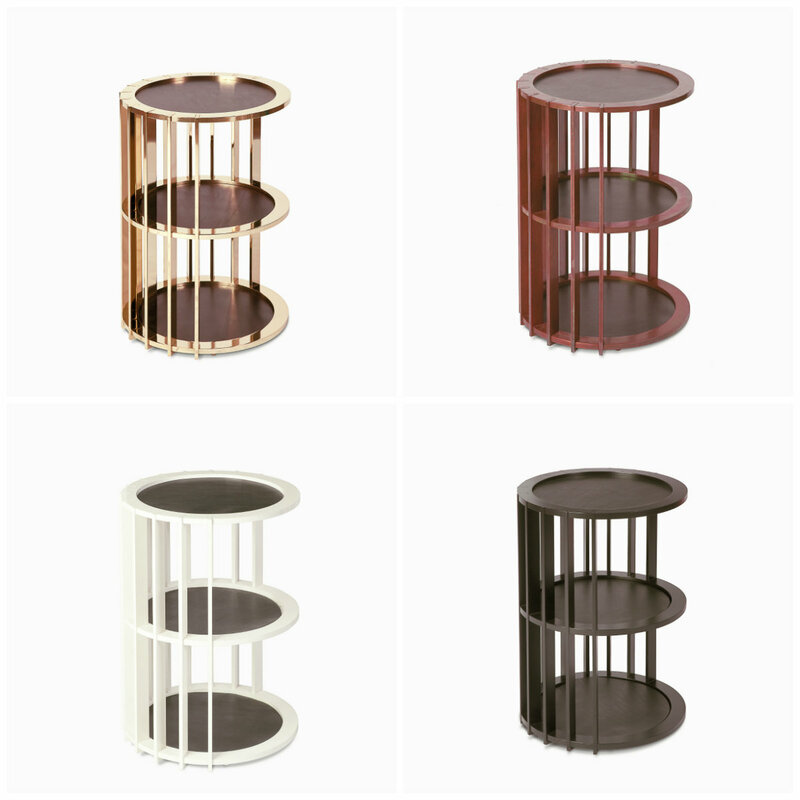 I have since developed the Rib further with a very accommodating metal manufacture based in the Midlands, as it is a manufactured product we are producing it with hand bronzing as a special and standard finishes either powder coated or highly polished metal brass or copper.